Bomb Mission Bomb Mission is one of the original modes that will test your tactics and strategies. This mode tells where the terrorist gets a mission to destroy an area. The area must be blown up using dangerous C4 bombs. 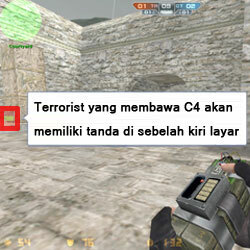 This is where the role of Counter-Terrorists is very important because they must protect the area with all efforts.. Protect the bomb area from Terrorist attacks. Taming C4 if the Terrorist successfully installs it. Kill all players from the Terrorist. Destroy the bomb area using C4. 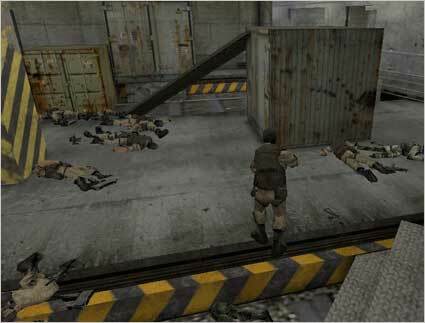 Kill all players from the Counter-Terrorist side. Press the E key to install or tame C4. 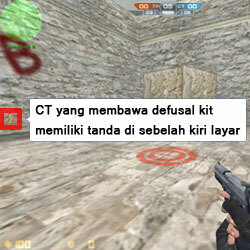 By using Defusal Kit then you can defuse C4 faster. Terrorist players who carry C4 will have a sign on the left side of the screen. Eachbomb mission map will have 2 bomb areas which are the target of the terrorist team. 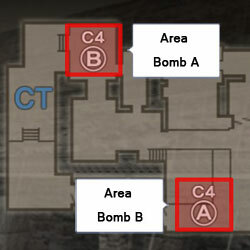 Terrorist teams can choose one of the two bomb areas and the location is marked with a "C4". There is only 1 C4 and one of the races will be chosen by one of the random terrorists who will carry the C4. 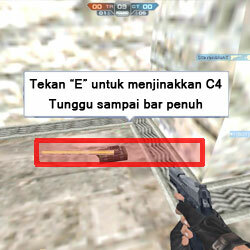 The player carrying C4 will have a sign on the left side of the screen and to use C4 press the "5" button. If the player carrying C4 is killed, then C4 will fall on the floor and can be taken by another terrorist. The place for C4 installation will be marked with a target circle. 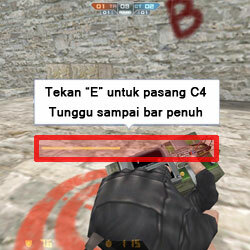 To plant C4, use the "E" button. Hold the E key until finally the full progress bar. There will be a notification after C4 has been successfully installed. Each map in the bomb mission will have 2 bomb areas that must be protected. The location can be seen on the map and marked with "C4". In order to more quickly tame C4, you need a Defusal Kit item that can be purchased at the start menu. 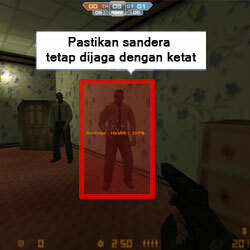 Each Counter-Terrorist can use it and if it has been purchased there will be a sign on the left of the screen indicating that the player has <Defusal Kit. Defusal Kit is one of the equipment used by Counter-Terrorists to speed up the C4 defused process. 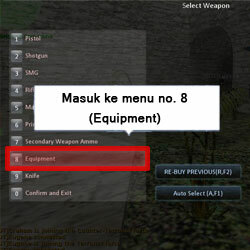 To buy it, select in the Equipment section of the initial menu during weapon selection. 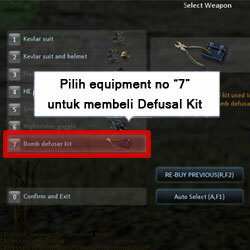 After entering the Equipment menu, just press the 7 button to purchase a Defusal Kit. Automatically your character will carry the item and can be used immediately. To install C4, use the "E" button. Hold the E key until finally the full progress bar. Annihilation is one of the original modes where the goals of both parties to achieve victory or full dominance. Both teams will attack and destroy each other to the most recent players. Really fighting until not the most recent blood because the victory will only be achieved for the team that managed to destroy all members of the opposing team. Your character won't respawn again when it's killed. The round will end if all players from one team have been overthrown. 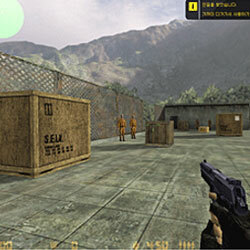 Hostage Rescue is one of the original modes where the Counter-Terrorist team started a hostage rescue mission from the Terrorist headquarters. The task of the Counter-Terrorist here is to ensure the safety of the hostages and then direct the hostage to a safe place. All of that will not be that easy because it is certain that the Terrorists will not allow that to happen, moreover the Counter-Terrorist team cannot shoot carelessly so as not to hostage. Save the hostages from the Terrorist headquarters and take them to a safe zone. Ensure that hostages are held captive and under close supervision until the deadline expires. Press the E button on the hostage to follow the Counter-Terrorist. Press the E button on the lost hostage to force the hostage back to the Terrorist headquarters. Press the E button once again on the hostages who have followed to stop at the place. The location where the hostages are held can be seen on the map and represented by "H". 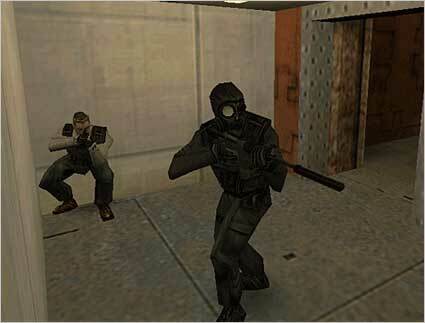 If the hostage is successfully led to the Rescue Zone, the round will be won by the Counter-Terrorist. Hostages will be inside the terrorist headquarters and you must keep them so they cannot be saved by Counter-Terrorists. If you shoot towards the hostage then ($) will decrease. 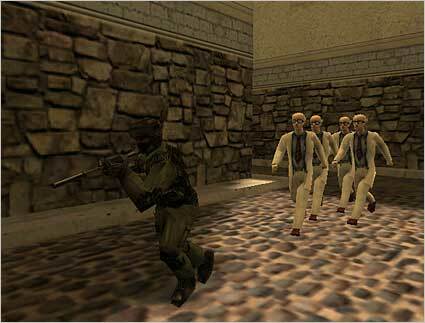 After successfully rescuing the hostages, the Counter-Terrorist team must bring the hostages to the Rescue Zone. Hostages will not move anywhere and only stay in the terrorist headquarters if no one takes him. 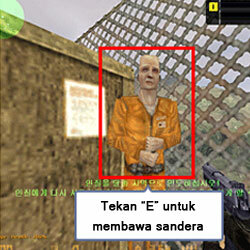 Counter-Terrorists must immediately bring their hostages and rescue them as soon as possible to the Rescue Zone. Press the "E" button to bring the hostage. Hostages will follow your character wherever you go. If a hostage is shot and killed it will reduce your in-game money ($). Hostages who have been rescued from terrorist headquarters must be taken to the Rescue Zone. 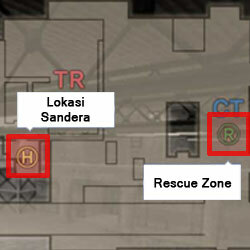 Each map has a different Rescue Zone and can be seen on the map. Assassination is one of the original modes that will definitely spur your alertness. Terrorist team gets direct orders to search for and finish someone who is considered very important from the Counter-Terrorist. This important person can be called the VIP. It is the duty of the Counter-Terrorist to ensure that the safety of the VIP can be guaranteed 100% and immediately fly it out of the dangerous zone. Secure VIP and ensure safety. Deliver VIP to the evacuation site. Destroying VIPs escorted by Counter-Terrorist teams. VIP can only be armed with a gun. 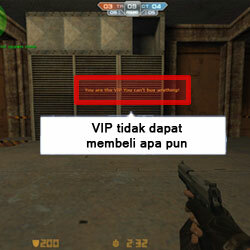 VIP cannot make purchases for weapons and equipment. VIP has more armor than other players which is 200. 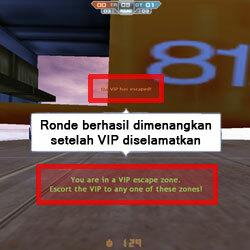 You can run as a VIP by pressing the "M" button. On the map you can see the location where the first VIP will appear and also the VIP evacuation zone. There will be a helicopter in the evacuation zone that is ready to transport VIP. Terrorists must ensure that the VIP cannot reach the place in any way. 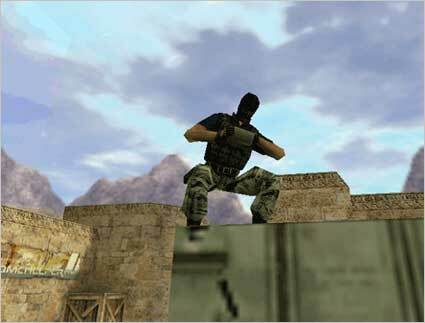 If not, the round will be won by the Counter-Terrorist. 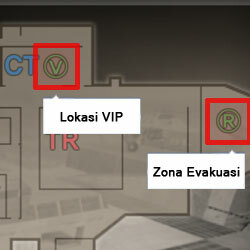 On the map you can see the location where the first VIP will appear. From the map you can also see the evacuation zone that must be addressed. Help VIP to get to the evacuation zone to win the round played. VIP will be chosen randomly from one of the Counter-Terrorist players available. 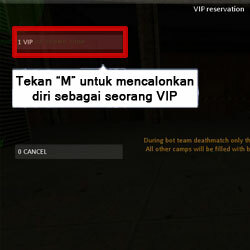 If there is a player who wants to run as a VIP, he can do so by pressing the "M" button. As a VIP you cannot purchase any items or weapons. But VIP has its own advantages, the armor used is thicker than other players. 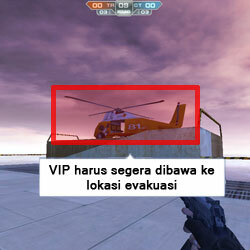 The main guide of the evacuation zone is a helicopter that is ready to transport VIP. Make sure the VIP gets to the helicopter and escapes from the terrorist pursuit. There will be a notification if the VIP is close to the evacuation zone. If the VIP is saved, then the round will automatically be won by the Counter-Terrorist and surely the entire team will get an additional $.